Mallorca’s emblematic pastry – not for vegetarians! This is an edited version of my article originally published (under my other name, Jan Dunn) in the Writers Abroad 2011 anthology Foreign Flavours (with foreword by Alexander McCall Smith). The anthology is still available for purchase from Amazon and contains a mix of fiction and non-fiction, all related to food in the countries of the contributors. Proceeds from the sale of Foreign Flavours go to The Book Bus – a charity which helps develop literacy and the joy of reading to children in the developing world. 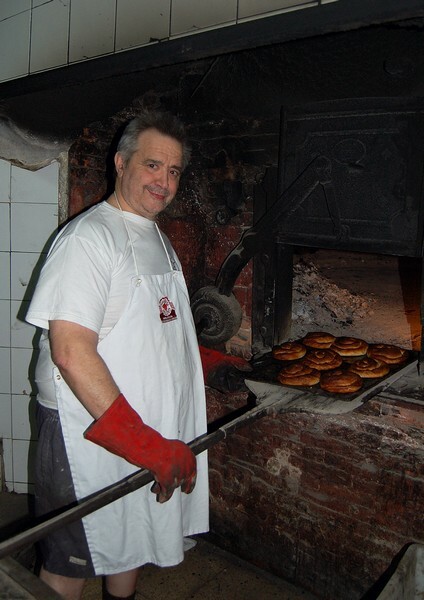 Note: Can Miquel bakery closed in 2013, when the owner retired. Sadly, Miquel Pujol, featured in the photos in this article, passed away this February, at the age of 66. You can’t miss the Spanish mainlanders passing through Palma’s airport departures terminal: they’re often clutching at least one large shallow octagonal box (and sometimes a small pile of them) containing Mallorca’s highly prized ensaïmada – described by 20th century Catalan writer Josep Pla as “the lightest, airiest and most delicate thing in this country’s confectionery”. Written references to the Mediterranean island’s ubiquitous yeasty pastry date back to the 17th century, but a couple of clues point to an even longer history: The root of the name is the Arabic word for pork lard – saïm – and the pastry’s spiral shape is believed to have been inspired by the turbans worn by the Moors, who occupied Mallorca from the 10th century until its recapture by King Jaume I in 1232. In the second half of the 19th century, the ensaïmada warranted inclusion in one of the most important published works about Mallorca. Archduke Ludwig Salvador of Austria had fallen in love with the island and bought three important estates (one now owned by Hollywood actor Michael Douglas). Adopting the island as his home, Salvador studied every aspect of local life and documented his findings in his magnum opus, Die Balearen (The Balearics). In his social commentary on the islanders, he cites the ensaïmada as the favourite confection of the middle and upper classes. Today, this pastry crosses all social boundaries and many of the sweet-toothed islanders eat them with a regularity that would make a British dietician or cardiologist blanch. With such a rich historical and cultural heritage, it rightly deserved the Denomination of Origin status, awarded back in 1996. Only an ensaïmada produced by certain bakeries can be sold as an authentic Ensaïmada de Mallorca – the Rolls Royce of these pastries. There are two official varieties: one, plain; the other, filled with a seam of pumpkin jam, known as cabello de angel (angel hair). As a handmade product, no two ensaïmadas look exactly the same, but certain consistencies are required: a minimum of two spirals – always clockwise; a round but slightly irregular shape, and an undulating golden top. The base must glisten and be smooth. When pulled apart, good flaky layers should be visible. The aroma and flavour should be pleasantly sweet, but with discernible evidence of good lard. Apart from lard, ensaïmadas contain strong wheat flour, water, sugar, eggs, and a “mother” (or starter) dough. Production is a lengthy process: After a considerable amount of kneading, the baker rolls the dough out thinly, spreads a film of lard over the entire surface and shapes the dough into a triangle. It’s then rolled into a long “sausage”, finally curling it into the required spiral shape and leaving it to prove for 12 hours. Given the heritage of the ensaïmada – and the labour of love involved in its production – any non-vegetarian visitor to Mallorca should at least sample one. They are surprisingly light and flaky. When to eat ensaïmada? It makes a satisfying snack or can be part of a meal – perhaps breakfast or the dessert in a traditional Mallorcan lunchtime menú del día. A large one is usually shared during a family celebration – be it first communion, birthday or saint’s day. Community-sized ensaïmadas often take centre stage at village fiestas: one baked for a fiesta in the village of Porreres weighed in at a hefty 50 kilos! 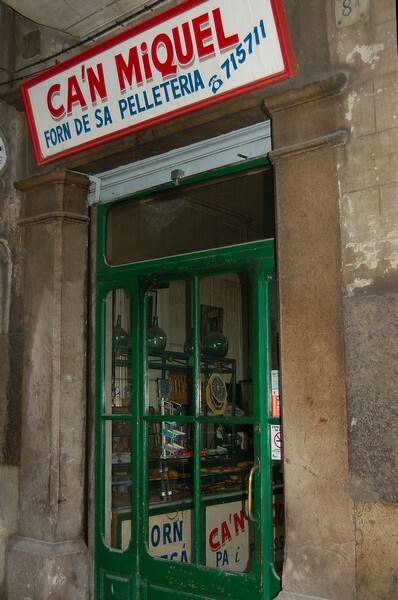 If you’re visiting Mallorca and want to try this emblematic pastry, there’s no more authentic way than to order one with a coffee or hot chocolate (in winter) in one of Palma’s venerable temples of local social life: classic old cafés such as the Lírico, Moderno, Progreso or Bar Bosch. 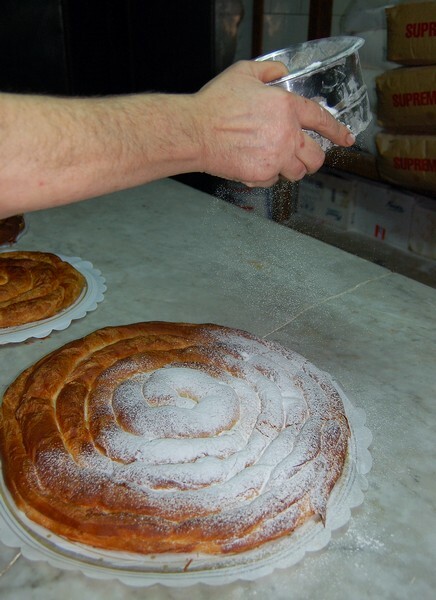 Better still, if you’re a very early riser, call at a bakery and buy your ensaïmada still warm from the oven and lightly dusted with icing sugar.